Enhancing the aerodynamic performance of such a finely tuned car like the GT-R is no small feat. When developing the car Nissan did a great job of developing an aero package that works well, but left some room for improvement for the true enthusiast. One of the most common complaints of GT-R owners is the car has a tendency to “push” when exercised hard on a race course (understeer). Two ways to fix this condition are through the suspension, or increasing downforce via aerodynamics of the car at higher speeds. Increasing the aerodynamic downforce keeps the front end of the car planted and therefore improving front grip, reducing the “push” effect. The STILLEN Urethane Lip Spoiler adds 2″ of length to the OEM fascia, and installs directly onto the vehicle over the factory piece. This lip spoiler is designed to hold additional air onto the nose, with flares on the side corners producing a canard effect for extra control. 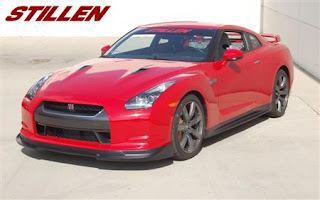 Continuing the aerodynamic stabilization of the GT-R, STILLEN has developed new side skirts with a 2 inch ledge built in to apply more downforce to the car. This design comes from the testing performed on the legendary IMSA Nissan 300ZX, campaigned in the IMSA sports car series at Le Mans, Daytona, and Sebring. Tested in the Lockheed Martin wind tunnel, the Nissan engineers found that by enhancing the side ledge on the rocker it applied a incremental amount of downforce at higher speeds thus keeping the car planted and more stable through high speed corners. Another major benefit of the rockers is the greatly improved appearance. Offering a much more aggressive look and race proven engineering these rockers are sure to catch attention and compliments. Just like all STILLEN body work these are constructed out of durable polyurethane, ready for paint, and offer a limited lifetime warranty. Perfect for daily driving or track days and utilize the factory skirt mounting points to ensure a perfect fit and finish.